Scene setting: The Palais de Tokyo feels like it was made for Rick. It is a grandiose, graphic 1937 construction outside, and yet inside it’s all about brutalism, raw edges and broken concrete. It has been the constant backdrop to the American designer’s shows for the last two years, and yesterday it provided the perfect contrast to Beethoven’s Piano Sonata No. 31, a romantic soundtrack far from Owens’ usual techno-inspired music. 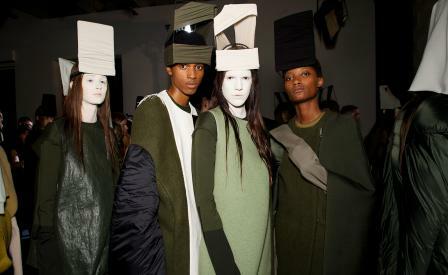 Mood board: Like Beethoven’s sonatas, Rick Owens was in a complex mood, at times melancholy, at times zen and uplifted. Gone was the glitter, the jolly Paleolithic-looking girls and the almost couture-style feathered capes of the past few seasons. This time, it was Owens stripped bare, all khaki and black. The designer’s hits were all there: the knee-high supple leather sneakers, the knotted puffas, the leather dresses, the long organza skirts. Make up was also more understated than usual, most of the models’ faces being covered by cotton and wire headpieces mimicking mitres, crowns and veils that had also a whiff of menagerie (they could also be elephants and donkeys). Sound bite: The question on everyone’s lips: ’Was it political?’ Not an easy one to answer, given that Owens usually loves to mess with our minds. However, post-show the designer stated, ‘After protest, one’s attention might turn to personal behaviour, and maybe embracing what makes us civilised can be our most positive act.’ Suddenly, the mood of the collection and the Beethoven soundtrack were perfectly explained. In a season rife with anger and protest, Rick’s serene stance was a heavenly breath of fresh air.